The Northeast Wisconsin Groundwater Management Area (GMA) consists of all of Brown County, as well as parts of Outagamie and Calumet Counties. The GMA has an area of around 700 square miles, lies completely within the Great Lakes drainage basin, and is home to more than 350,000 people. Millions of gallons are pumped from the confined deep aquifer in northeastern Wisconsin each day for industrial, commercial, municipal, and residential uses. Some cities now use Lake Michigan surface water for their water supply. Green Bay switched to surface water in 1957 followed by eight surrounding municipalities in 2007. These communities still retain many of their high capacity wells to serve as alternative sources in case of emergencies. This switch to surface water has caused a significant rise in groundwater level in the deep aquifer. Diagram showing how water moves through underground aquifers (from water.usgs.gov). Groundwater in sandstone in the deep aquifer is isolated or confined in the GMA by 3 different overlying stratigraphic rock layers. Some of these rock layers contain groundwater contaminated by bacteria and nitrate or contain faults or fractures that may permit contaminated water to flow into the deeper aquifer. 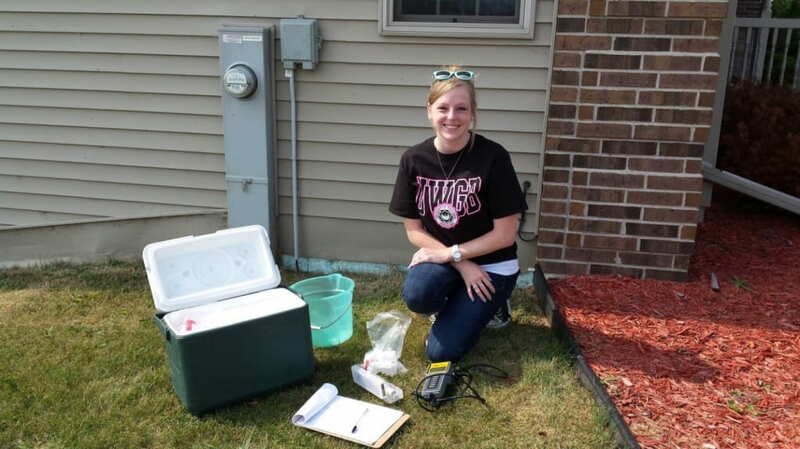 Amanda Hamby with the equipment she uses to collect water samples from wells. Do regional faults have an effect on water chemistry in the confined deep aquifer in northeastern Wisconsin? How has water chemistry changed in the Northeast Wisconsin Groundwater Management Area since Green Bay and other municipalities stopped pumping water from the aquifer? They are collecting water samples from a number of wells in the GMA to assess for alkalinity and a number of ions in the water. Samples will be radio-carbon dated to get an idea of how old the water in the deep aquifer actually is. Amanda is also collecting stable isotopes of oxygen and deuterium that can be used to follow water movement through the atmosphere, surface waters, and into the aquifer. Amanda is using the isotope data she collected in conjunction with GIS mapping to create a natural isotope landscape or “isoscape” of the Northeast GMA deep aquifer, one of very few such maps of deep aquifers. The results of this project will increase our understanding of how local faults affect groundwater chemistry and water quality in the northeastern Wisconsin. This project will also aid in our understanding of how groundwater level increase in the confined deep aquifer has affected water quality in the Northeast GMA. Amanda’s research is supported by a grant from the NAS Heirloom Plant Fund at UW–Green Bay.